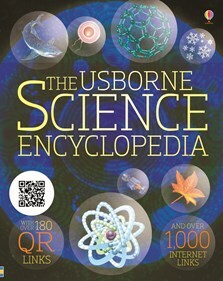 The latest edition of the Usborne Science Encyclopedia has 180 QR codes printed on the pages of the book. The QR codes provide instant access via a mobile phone or tablet to websites with video clips of experiments, animals in their habitats and animated lessons. For more about QR codes, see Technical help. The QR code links are also included here at Quicklinks as Website 1 for each double page. All the links are relevant for all editions of the Usborne Science Encyclopedia and use the same page numbers. Choose a page number to see the links. Watch a video clip about atoms and what's inside them. Zoom into a soda can and see just how small atoms really are. Find out about the different parts of an atom in a "giant atom model". Watch a tutorial that explains the frequency, period, wavelength and amplitude of a wave. Choose the correct number of protons, neutrons and electrons to build atoms online. Read some quick facts about atoms. A comprehensive science reference book covering key topics from gravity, flight and floating to genes and DNA, with clearly written explanations and superb photographs and illustrations. QR codes for each topic provide instant access via a mobile phone or tablet to over 180 video clips of experiments, animals in their habitats and animated lessons that enhance the information in the book. Includes links to an additional 1000 recommended websites for further study and homework help via the Usborne Quicklinks website. With a glossary of 1,500 scientific terms, as well as key dates and biographies of scientists and inventors, and 140 simple experiments for children to try at home. An exciting reference book that will stimulate children’s curiosity and inspire the scientists of the future. A superb reference book, likely to encourage much happy browsing as well as to provide solid information to support school work... Text is clearly presented in short blocks, making it inviting to read and the information is conveyed clearly and succinctly. I love this book. The QR codes bring you directly to a YouTube page or website that connectd the contents of the Encyclopedia to a related video! The contents in the book are very helpful and provide many examples!